>What a great last few days. (Get ready for plenty of links for non-tri people.) So much has happened. Lifesport and Blue created a lounge for people to hang out in during the week. Here is Moj with the new Triad SL. 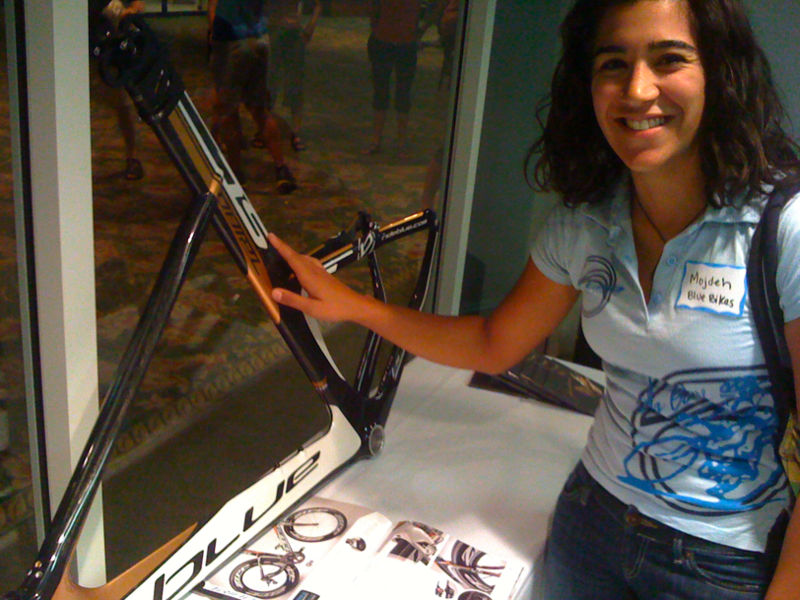 Blue showed off some bikes and allowed us to demo them. 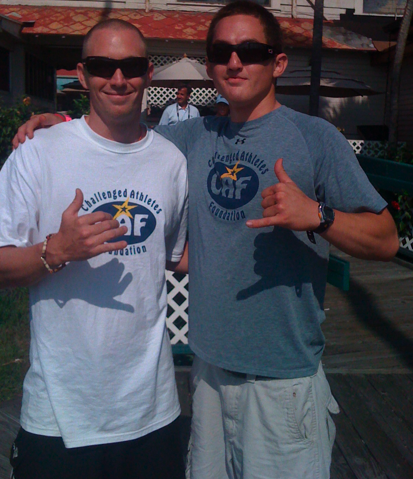 My buddy Nguyen flew in from O’ahu to hang out and help volunteer in the water with us. 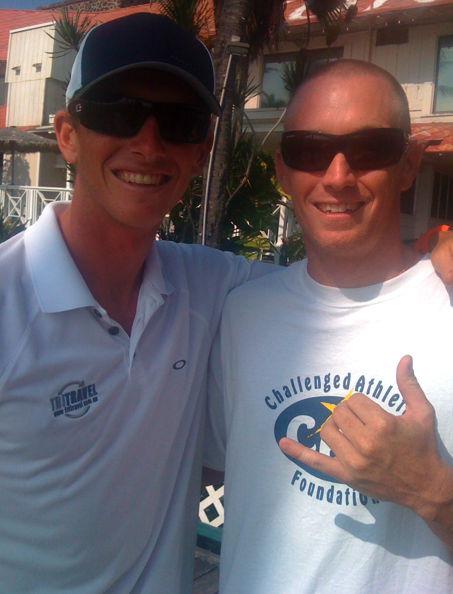 He owns Momentum Multisport. We demoed a couple of Cervelos today. I got on the new P4. It felt very skinny. It didn’t climb as well as my Triad. It was nice, but I wouldn’t spend the money on it. While riding we met a pro from Spain. Over the last few days, I have hung out with Marky V, met Amanda and Michael Lovato (cool people), yelled at Mitch Thrower, saw Macca giving interviews, Chrissie signing autographs, all kinds of cool things. 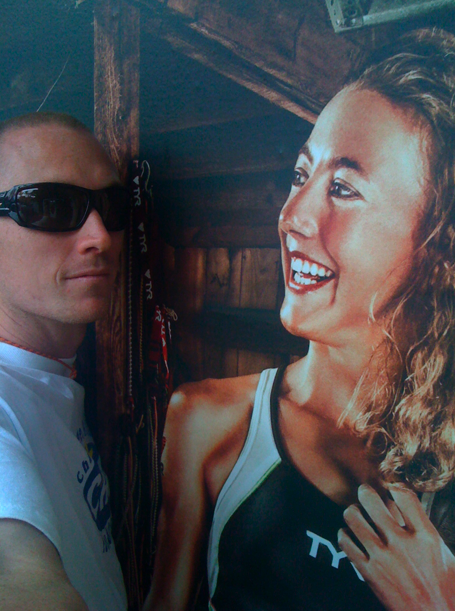 We hung out a the K-Swiss booth for a while as well as the Avia booth. Maarten van der Weijden picking the winners. 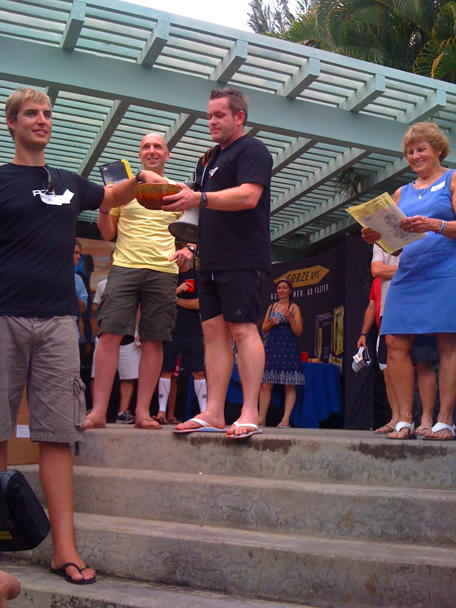 We got to attend a party at the BlueSeventy house organized by Slowtwitch. It was cool to put faces to names. There was a raffle where lots of people won prizes. Maarten van der Weijden was the Olympic gold medal winner in Beijing for the swimming 10km. He picked the names of the winners. He is huge. Chrissie touching herself while giggling at me. If you don’t know who Rudy is, check him out here. Luke Bell was also wandering around so I snagged a picture with him. I like his Zoot suits every year. We have been hanging out with Erica while in Kona. We went snorkeling at Kahalu’u. Tomorrow, is race day. I am excited to see Terenzo, Macca, Lieto, Crowie, Rudy, Ian Charles, Nick Kaiser. Everyone! Going to bed now. We are getting up early for water patrol. Sunday is Ben’s race. What a great weekend. This entry was posted in Ben Collins, bike, Marky V, vacation by Rory. Bookmark the permalink.